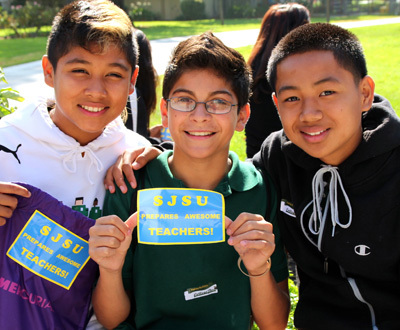 SAN JOSE, Calif. – SJSU will host a new Family and Community Conference on Oct. 19 in conjunction with College Day, a county-wide college-going effort. The free conference will include a “College Fair,” with representatives from numerous colleges. Attendees can also participate in multiple workshops on topics such as “College Knowledge” and “How Financial Aid Works.” Participants will learn how to complete a FAFSA or California Dream Act application. A “College Success Lab,” with CSU/UC admissions experts will be available all day to assist high school seniors and their families. Sessions will be presented in English, Spanish, and Vietnamese. “By offering lesson plans, information resources and speakers to all Santa Clara students – especially those who will be the first in their families to go to college – we hope to inspire them to believe that they can afford college, and to start saving today, whether they are fifth graders or seniors in high school,” said Dana Bunnett, College Day Chair. College Day activities will take place on the campuses of elementary, middle, and high schools across the valley. The Family and Community Conference will take place at SJSU. On Oct. 11, schools in Santa Clara County participated in College Day. Students took part in interactive activities to inspire and support their aspirations for a college education. This year’s theme was “College: There’s Always a Way to Pay,” and activities centered on financial literacy and financial aid information. Every school designed its own College Day. Students opened savings accounts at elementary schools, had classroom lessons in “Comparing Financial Aid Packages” at high schools, or listened to community members speak about how they paid for college. Among the speakers were San Jose State Vice President for Student Affairs Bill Nance. Now in its third year, College Day is spearheaded by the volunteer-led First-Generation College Attainment Coalition. The goal of College Day is to create a college-going culture in Santa Clara County, and to inspire and support first-generation students in their pursuit of a college education.Supporting Financial LiteracyMajor sponsors include the Applied Materials Foundation, ScholarShare, Kids in Common, SJSU and Downtown College Prep. Other sponsors include San Jose Mayor Chuck Reed, and San Jose City Councilmembers Xavier Campos, Rose Herrera, Ash Kalra, Sam Liccardo and Don Rocha; and the Leo M. Shortino Family Foundation. Organizations that have collaborated to make College Day a reality include: Advancement Via Individual Determination (AVID), ALearn, Boys & Girls Clubs of Silicon Valley, Breakthrough Silicon Valley, College Board, College on Track, CommUniverCity, FIRST 5, Franklin McKinley Children’s Initiative, GoVoluntr, Mission College, Parent Institute for Quality Education (PIQE), Sacred Heart Community Services, San José Public Library, Santa Clara County Office of Education, Silicon Valley Leadership Group, Summer Search, University of California Berkeley, Center for Educational Partnerships (Destination College Advising Corps) and University of California, Santa Cruz, Educational Partnership Center (San Jose Cal-SOAP). Learn more about College Day.